I am trying an experiment, based on what I think I read in Gardening When It Counts: Growing Food in Hard Times by Steve Solomon. 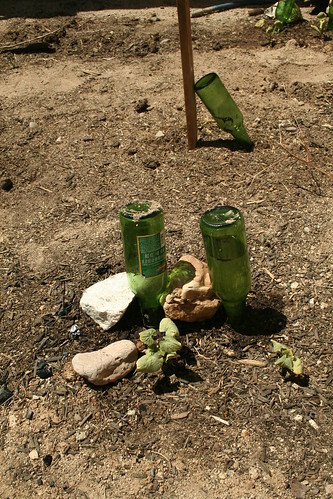 I filled bottles with compost tea and put the bottle upside down “above” the plants. The tomatillo seems to be doing the best. The rest of the plants still look a little thirsty, especially the squash. 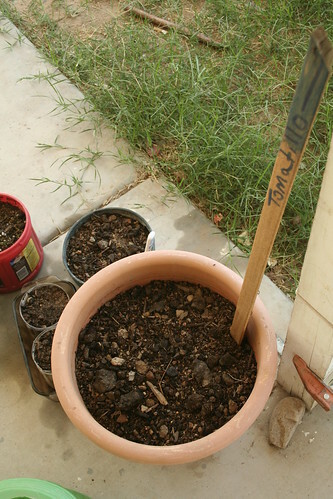 Also, after seeing what my friend Karina has done with growing plants in pots, I planted some plants in containers. Hopefully, I will be more succesful than in the straight soil. 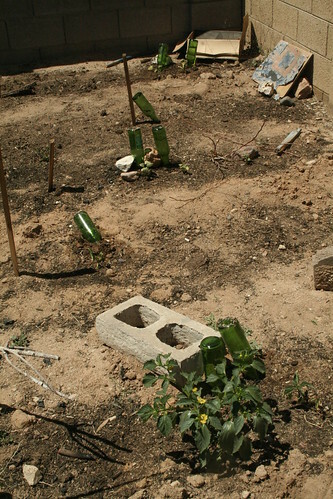 I planted tomatillo, tomato, and creosote. The seeds from the creosote I gathered myself in the desert. Creosote is truly the pharmacy of desert plants.